The 60s were the age of the megastructures, the age of the Utopian dreams, the age of the revolts against the established. In turn they were the epoch of the construction of the imaginary common one. The age of a politicallly active, almost arrogant optimism; At the beginning of the 70, probably for pure law of the pendulum, it came the time of the apocalyptic visions, of imagining a world in the maximum decadence, of extreme fictions in his negatividad. The beginning and the end of this age comes framed by two mythical exhibitions in the MoMA of New York: Visionary Architecture in 1960 and New Domestic Landscape in 1972. This temporary frame coincides almost to the perfection with the symbolic fact of the choice as president of JFK John Fitzgerald Kennedy in 1960, and the advent of the crisis of the oil of 1973, that is to say of the crystallization of a new age, visionary, Utopian, optimistic, of a side, and of other one, the catastrophic implosion of the negatividad, distópica and pessimist. The imaginary common space of this tour comes structured by the possibility, today practically inconceivably, of taking part of a joint vision. It is not explicable but otherwise, that in different points of the planet, architects, artists and creative of any condition, were capable of, in an incredibly short time, to create a culture specifies, a common statement, an informed aesthetics. This decade, for strange, or not so strange reasons, constituted the most extreme beak of the overflowing creativity, so much it is his well-meaning versions as in the readings and the most critical, and even cynical visions. Today, the decade of the Utopias is enormously inconsiderate. A strange sensation of foreign shame before the imaginative excesses and deliriums of the moment, they do not allow to see with clarity the nourishing force and the offers of undoubted value that in terms proyectuales, the hundreds of Utopian projects, to throw on a future, which today still they constitute an enormously nourishing fabric to think the architecture. I do not believe that it tries of returning to promote a logic of the Utopian thing at this point, the magic moment of the 60 will not return, and in addition, we would have the imminent danger of falling down in the nostalgia. Nevertheless, it is necessary to have a deep and conscientious, lacking in passion and rigorous reflection of a moment of the history of the architecture, where multiple voices seemed to go, with singular and very different offers, it yes, in the same direction. It is difficult to understand that in the majority of the schools of architecture, still today, this sweet moment of the creativity is still had buried by a general disqualification, a scorn by the dreamers, of an epoch, and there is diluted a spirit, which good lack does to us now. The spirit of dreaming. Only some qualified voices, of form slightly coordinated and stimulated by his most notable historical interest they seem to recover occasionally, these forgotten voices. The extraordinary ambulant exhibition Clip/Stamp/Fold, curator and led by Beatriz Colomina,1 and the last book by Rem Koolhaas and Hans Ulrich Obrist, brings over of the metabolist janponese architecture,2 for putting two very well-known and recent examples, they seem to channel a certain background noise, consistent in recovering for the contemporaneousness the fundamental soul of the architecture, materialize, in the will to imagine and dream if it is precise. 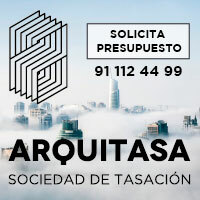 One of the most interesting acts, for architectural and little known that exemplify this need to imagine and dream, is the declaration of a new country, NUTOPIA, on the part of the imaginative excellent pair of this epoch. I refer to John Lennon y Yoko Ono. If as he says Rem Koolhaas, every architect has in his genes the Utopia, in case of Lennon and Ono, this genetics was specially generous. 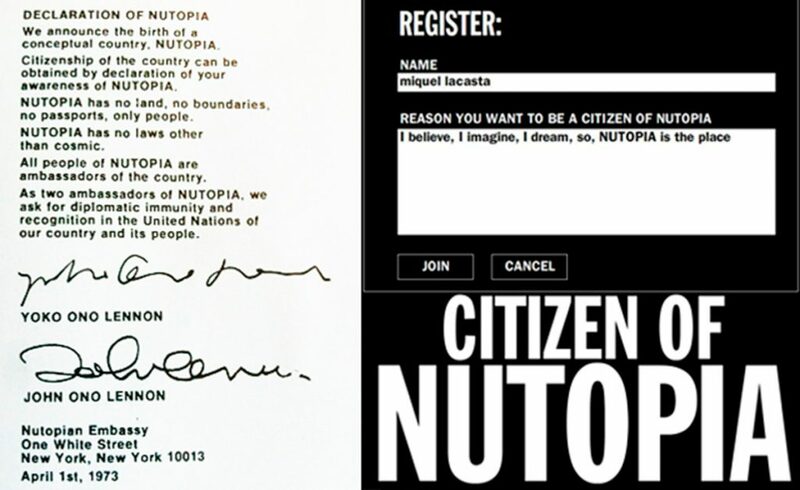 The action performativa of Nutopia realized as declaration in April, 1973, consisted of the declaration of a new conceptual country, where basically only there are people, that is to say, Nutopia consists of a virtual place, where there exist neither lands, nor borders, nor passports, nor any other law any more than the cosmic law. A place that designates as ambassadors to all the belonging ones to Nutopia and the recognition of the UNO is asked. It is curious what Nutopia is alike, to Internet. Today we know that from a social and cultural point of view, a part of the Internet that we know today, was taking part and it continues taking part of the spirit of specially generous Nutopia.ue. It is for it that of fact Nutopia already exists in the network,3 and of totally free form and simply for pure empathy with a certain way of understanding the world, a certain way of looking and dealing, of constructing a statement simultaneously market and optimistic, or simply for nostalgia of a historical moment where everything seemed to be possible, any person, without requirements of any type he can be a citizen of Nutopia. I do not know if the doctors or the attorneys should be necessarily citizens of Nutopia, but I think that the architects definitively if that they should form a part of an imagined place, which activates the imaginary thing. If we lose the aptitude to imagine, we lose the entire architecture. In fact I am sure that we should leave that in architecture, the imagination was overcoming the intelligence.